Density advocates will celebrate the appearance of two 4-story development projects on the East Design Review Board agenda this week while some in the neighborhoods around the projects might feel like pushing back. This push and pull of the midrise-40 zone will be on full display at Wednesday night’s design review board sessions. Here’s a look at the two projects. This 4-story housing project shouldn’t feel out of place at all. Planned for smack in the middle of 12th Ave just east of Cal Anderson Park, the 37-unit building will neighbor multi-story buildings up and down the street — some nearly 100 years old. The project is headed by developer Gramor backer of area developments including the apartment complex home to E Madison’s Trader Joe’s. Unfortunately for you Joe’s fans, Gramor isn’t planning any retail as part of this forty-foot project but it will include two additional live/work units. Architect is Caron Architecture. You can view their recent multifamily projects here. The developers list the following the objectives for the project in the design packet for Wednesday’s early design guidance session focused on big picture issues like massing. The full design document is embedded below. The proposed development will create an urban mixed-use apartment building with street level live / work lofts and provide an enhanced pedestrian experience in the urban village neighborhood. The ground level of the preferred scheme consists of a residential lobby, 5loft units facing a private interior courtyard or rear of property, and 2 commercial live / work lofts facing the street. The commercial live / work units will have direct, individual street access, while the loft units will have ground level amenity space and individual entries. The second, third and fourth floors each have a mix of studios, open one bedrooms and one bedroom units, for a total of 10 units per floor. The roof of the building will be accessible and act as an amenity space for tenants with opportunities for entertaining, gardening and relaxation. Parking is not required for this site, and the lack of alley access will dictate use of the street level area for building services. To enhance the appearance of the services required on the street, we propose an open breeze-way with screening which will allow visual connection to the interior courtyard and a view of the landscaping. The building will meet current required energy codes and will obtain a built green rating. This project from Rudd Development might not fit into its neighborhood as snuggly as the 12th Ave 4-story but it’s also not unprecedented in the immediate area. Across the street sits another multifamily development. 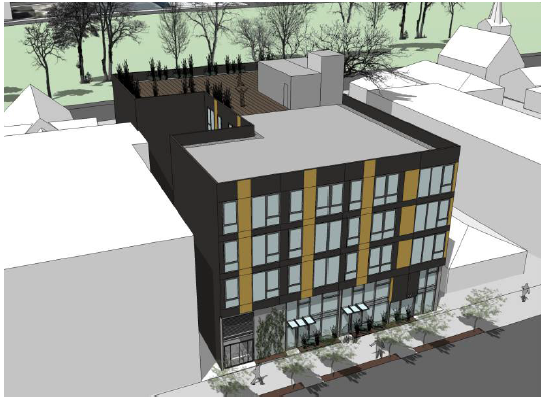 1823 18th Ave is planned as a forty-foot building with 20 units and parking for nine vehicles. To make way for it, a more-dilapidated-than-it-looks-but-still-kind-of-charming 1901 house will have to be leveled. The proposed project is a multi-story, residential apartmentbuilding containing residential apartment units in the upper levelsand parking in a subterranean garage. The height of the building isanticipated to reach the maximum limit of 40 feet. The existingsite maintains vehicular access from the developed alley. Allvehicular access, refuse / recycling storage, and other services areproposed from the alley in Option A. Options B and C proposevehicular access and refuse / recycling pick-up from 18th Avenue,while Option D proposes refuse / recycling storage along the alley and vehicular access from 18th Avenue. Refuse / recycling storageis within the building envelope in all options. The residentialentrance lobby is located at the corner of E Denny Way and18th Avenue in Options A & B, and Options C & D propose anaccessible lobby accessed along 18th Avenue. Residential amenityspace will be provided through a combination of the following:street level landscaped areas, private decks, and a commonarea courtyard at the ground level. Construction of this projectrequires the demolition of two existing two-story single family residences. The architect is grouparchitect. You can review their recent multifamily projects here — including a bold but mothballed E Thomas project that is approved and on the development clock with a 2014 land use expiration. The 1901 house and land were purchased this summer for $778,000. “No parking required”…..really? I’m all for limiting the parking requirement for new buildings (one space per unit), especially in areas where there is easy access to light rail, but no parking at all is not accceptable. Residents with vehicles will have to park on the street, adding to the already-tight situation. This is exactly the sort of density that we’ve been looking for. It’s in scale. It takes into consideration the type of tennants that might be living in the building with the live/work spaces. They understand that living in the most densely populated urban area in the state/one of the most heavily-used-by-transit neighborhoods in the city/one of the most heavily trafficked-by-pedestrian areas in the city may lead some people to live carless. Let’s not forget that we are litereally blocks away from the largest commerical and economic hub in the region too. or they will choose to live in another building with more parking. There are plenty of them coming online in the next few years. Who knows? They might even (dun dun dun) give up their car and use light rail/the bus/a bicycle/their feet/zipcar/taxis? You make it sound like 4 stories is a new thing to the Hill! Look around, this is the most common multi-fam typology, and I am all in favor of continuing the trend. So many brick walk-ups were built in the 20th century that were four stories with no parking. Seems exactly right. No spaces for the 12th Ave property seems OK…though maybe tough for the operator, as there really is almost no street parking in the evening in that neighborhood, and once the performing art spaces goes in 1 block S on 12th, wow. But only 9 spaces for the one on 18th Ave? I can see the neighbors flipping out on that end of the neighborhood, no way would I live E of 15th w/out a car. Or they might be like me and choose to live there BECAUSE they don’t have a car. I live half a block from this location and it’s outstanding for those who don’t want to own a car. And there are a few different Zipcar locations within 2 blocks. Calhoun is right. We need to force developers to build parking whether or not the market demands it. First of all, it will ensure that the cost of the project is higher, forcing the developer to charge higher rents. The higher the rents on the Hill, the better! Second of all, the street parking that exists should be reserved for the people who already live here. I have a 6,000sf house that I paid a small fortune for. Unfortunately it was built during the pre-automobile era, so I don’t have a garage. Where am I going to park my 3 vehicles if all of these new people are allowed into my neighborhood. No parking requirements are unacceptable! I hope 12AA is planning to rent a parking lot for their theatre goers, because they aren’t all coming here from Cap Hill, and at night, there is no street parking in this area. Which I think is fine for residential – lots of people go without cars here. But in terms of business or performing arts, that is hard. whether we like it or not, lots of people come here from (gasp) bellevue, to experience the hood, and we should be making this as easy as possible for local businesses. The 18th Ave pic shows 5 above ground floors but the article says the limit is 40 ft. Can they really fit 5 stories in 40 ft? I believe they are counting it as 40 feet from ground level on the alley side. Since there is a slope steep enough to equal another floor, it appears to be ground floor plus 40 feet. OK, I can accept the possibility that some people without cars will move into this building, but it is very unlikely that all of them will be car-less, so it is inevitable that there will be added pressures for parking on the surrounding streets. Would you guys feel the same way if you lived nearby and had more trouble finding a parking space? I DID say that I favored less parking requirement in the revised building codes, didn’t I? But to provide NO parking at all is swinging the pendulum too far in the other direction. I don’t think there are many of these original Victorian farmhouses are left on the hill or in Seattle at all. It’s a real shame to lose one. That building is an eyesore. Bound to be entirely too expensive for real people to live in, to boot. You can force them to build a parking garage, but then you’re not allowed to turn around and complain when homeless people then use said garage as a camping/drug site. Steve I actually stood in front of that house and cried last week. I wish you had bought it. I wish te developer would please sell this house to anyone and go elsewhere. More dilapidated than it looks?!!!! Oh yeah that sounds like a factual statement backed up by what’s that nothing? This 1890 farmhouse was built when seattles population was less than 15,000 prescient to the gold rush. I’ll bag your groceries I’ll pay rent to live and rich people will keep tearing down my simple dream to live in an old wooden house with a soul to build a glass houses and multi unit structures. I’m tested to chain myself to that house. How can people have gotten weed legalized in ths state and we can’t stop shortsighted development.